So far Gigaclear has already completed their Phase 2B contract for SFE (4,000 premises in Epping Forest) and until a few months ago they also planned Phase 3 work (i.e. 8,300 premises in Uttlesford and Central North by Dec 2019), as well as the recently won contract for Phase 4a (2,100 premises in Epping Forest). Unfortunately it was confirmed last year that Gigaclear’s roll-out was struggling “due to the complexity of the network build coupled with resourcing challenges“. As a result work under Phase 3 in the Uttlesford District and parts of Braintree District and Colchester Borough and Phase 4a was delayed to complete by July 2020, rather than December 2019. On the upside Gigaclear’s delays in Essex weren’t nearly as serious as they have been in other parts of England and happily the operator has now started their deployment in Uttlesford, with 212 homes in Birchanger being among the first to benefit. Getting this far was a major task, which required the ISP’s contractor (Kier) to dig up 5.3km of carriageway, footway and verge to lay just over 6.5km of new fibre optic cable. “This marks the start of a hugely exciting time for residents and businesses who live and work across the Uttlesford District. 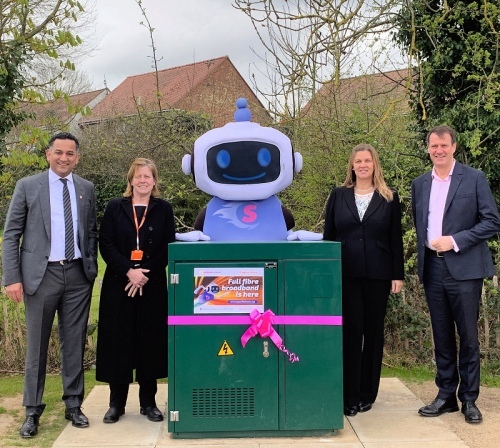 We believe passionately in the importance of digital inclusion for all, no matter how rural their chosen home or business is, and we are delighted that our network is bringing world-class broadband speeds to residents of Birchanger in partnership with Superfast Essex. “I’m thrilled residents can now buy ultrafast broadband in Birchanger because of Superfast Essex’s work with Gigaclear. This is the first of many cabinet areas due to be connected, meaning shortly even more Uttlesford homes and businesses will be able to benefit too. The £6.8 million Phase 3 contract is ultimately expected to connect a total of 4,600 properties in the Uttlesford District. Admittedly the roll-out in this area may take longer than originally planned but the delay isn’t unreasonable for such a complicated engineering project. I contacted the build team the other day and they tell me that work should start in July for my area. If you are in Lot3c then I guess you must be between Westbury-on-Severn and Newnham? I know they have finally got around to installing backhaul between Minsterworth and Westbury (about 9 miles so far – in 2 years or so). I’m towards the far end of the A48 in Lot3c, so it will be some time before they get to me. Currently the nearest active Gigaclear connection is 22 miles by road from me. Is July the same date as you had before the removal of the schedule back in September? There are no roadworks shown on roadworks.org – they should usually appear 3 months before work starts, and there is no obvious existing Gigaclear infrastructure for them to connect to – they are building outwards from existing networks, so I’d expect to see roadworks along the A40 from Highnam (in the same way as they are moving down the A48). The latest date I’ve been given is for a start sometime early next year, with the build taking a year (all being well). Of course, every previous date I’ve been given has passed with no work being started, and given the apparent rate of progress I don’t believe they can achieve that. It’s was originally planned for August this year but the last I spoke to them they had brought it forward to July which was unexpected. Gigaclear have used Kier Group for the BDUK projects, but their commercial projects in Essex are still dogged by delays from using unsatisfactory smaller contractors I guess on low rates to support very thin margins. Here last month they sacked their fourth contractor in 3 years for a bad job – so it’ll take another 3 months to find yet another cheap contractor. Unsubsidised commercial rural FTTP perhaps just isn’t deliverable.